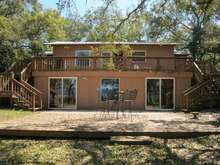 We specialize in managing and marketing short-term vacation rentals in the Alligator Point, Florida area. As experienced owners of several vacation rental properties ourselves, we understand what it takes to successfully manage a property. We provide an eye-catching exterior sign on your home to identify it as a vacation rental as well as for marketing purposes. We get many calls and compliments on our bright signs. We also include a guest information book in the property filled with helpful information such as guest services, phone numbers for attractions, activities, and equipment rentals and other tourist information. We post rules, check out instructions, and emergency contact numbers in your home. Our guests are very appreciative of all the useful information provided along with their vacation rental. We are here to protect the owner's property. All guests are required to sign a rental agreement and review the policies. We primarily rent to families or adult groups over the age of 25. Some preventative measures we include in our agreement are not allowing house parties, not allowing the number of guests to exceed the published capacity of the home, and not renting to student groups under the age of 25. We do everything we can to protect your home and your investment. With a solid customer base of loyal guests and referrals continuing to build an even broader base, occupancy rates approach 100% during the summer months. Even our most expensive vacation rentals with weekly rents of over $2,000 per week have strong occupancy. Harbor Point takes special pride in managing our vacation rentals and treating them as if they are our own. Because everyone who works with Harbor Point lives in or near the Alligator Point area, one of us drives by every managed property almost every day. We take care of overturned trash cans, overgrown lawns and leaking water pipes right away. Harbor Point is proud of our rental management system that integrates with our website and provides real-time availability calendars, as well as credit card processing. Potential guests can send a specific rental request directly from our webpage that becomes a reservation once our manager confirms the information. Owners of our vacation rental houses can log into a special section of our website to make their own reservations and check the status of their properties. Additionally, our system allows us to electronically manage the cleaning and maintenance of each property as well as the monthly income statements to owners. Harbor Point Vacation Rentals advertises online through search engine placement as well as Visit Florida, which is the state's tourism development agency. Reservations are also generated through periodic mailings to all past rental guests. We are accepting a limited number of new beachfront vacation rentals properties to manage in the Alligator Point area. If you are interested in finding out more about our rental management program or making reservations, please call our property management team at 850-349-2696.